You’ve heard of the one bag travel system…but have you heard of the TWO bag travel system? Here’s how it works. What you’re going to want to do is toss your backpack on like normal, then grab ANOTHER backpack and toss it on your frontside. Totally balanced and very turtle-like, this method gives you the ability to double your carrying capacity with literally no downsides! In fact, we’d argue there are only upsides—you look like a total boss, you’re protected from all sides in case of an armed attacker, and although your visibility will be severely impaired from the front, everyone will just get out of your way. It’s the next packing hack that’s sweeping the nation. No offense to people who go for the two-backpack method, but it’s not really our style. When we talk about a two bag travel system, we’re talking about a backpack and a DUFFLE, of course! Which leads us into this review. 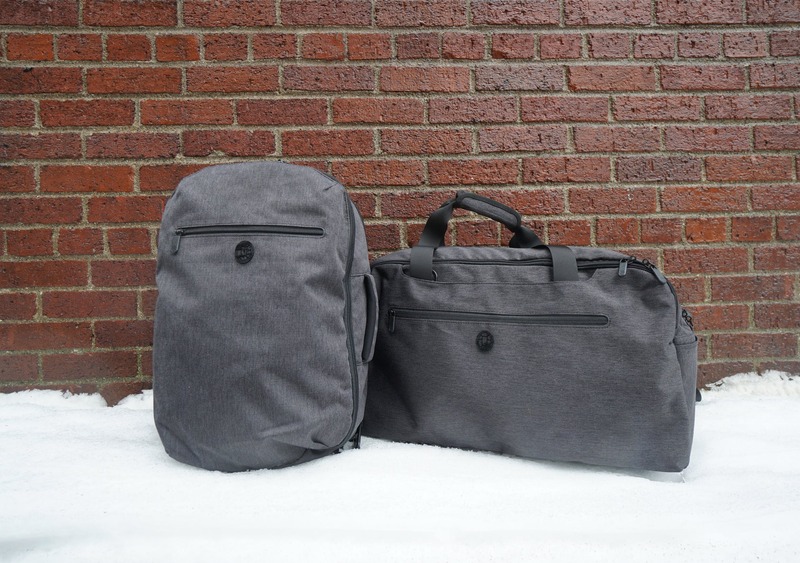 The Tortuga Setout Duffle Bag is intended to be used with the Setout Laptop Backpack as a two bag travel system. In theory, this method makes total sense. 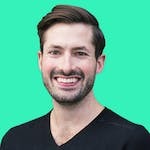 You have all of your clothing and other gear inside your larger duffle, and then in your smaller backpack you have your laptop and other items that you use when you’re traveling around the city exploring for the day. Now, this is all great if you’re flying on an airline that allows you to take a carry-on and personal item that are both fairly sizable. 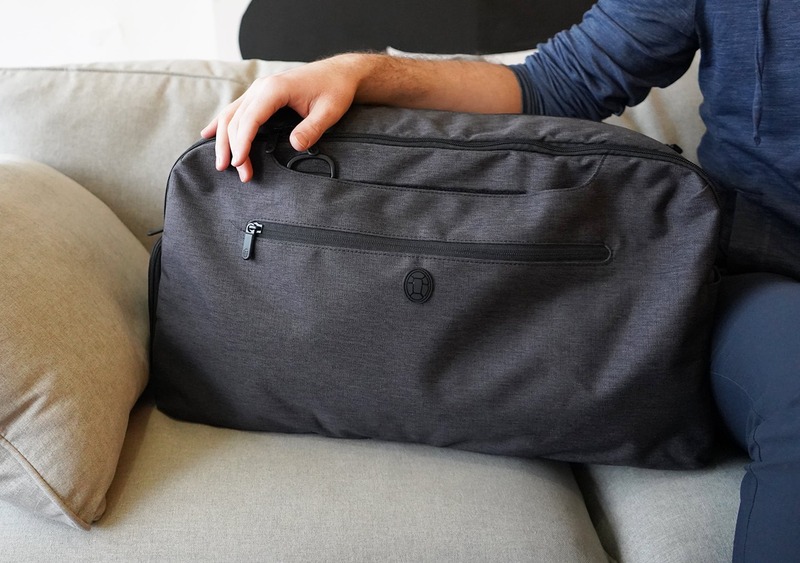 In our experience, a lot of European and Asian airlines charge extra for this type of carry-on system—which is why we typically recommend using a packable daypack inside of a larger bag, in order to just have one carry-on. With all that said, let’s get into this review and see how the Setout Duffle—and the two bag method that goes along with it—works in practice. The main fabric on this pack is a 900D heathered gray polyester material. This is the same fabric that we’ve seen on a lot of the other Tortuga Setout products. As with any Tortuga product, you can find their logo all over this bag. It’s kind of a fun scavenger hunt to see just how many turtle shells you can find on a Tortuga bag—they sneak them in anywhere they can find. To start, there is a simple black logo on the exterior. The logo is also imprinted on the zippers in a tasteful black-on-black style, and you can spot them on the metal buckle for keychains and other key-like items on the interior of the pack as well. We think the overall design of this bag looks decent and polished, especially since you can hide a lot of the straps. However, we do think the size is a little bit large, and the overall shape of the bag can be a bit bulky. As always, we polled our Instagram audience and a fairly-convincing 66% of our audience did not like the look of this bag. So, we’re not sure whether that’s due to the size or the overall look—but there you have it. 66%. #DATA. The zippers used across this bag are #8 YKK RC (racquet coil) zippers, which are strong, durable, and lockable in most areas with two zippers. We’d kind of like to see a duffle of this size using a more robust and durable #10 zipper for the main opening, but the #8 is still really solid. And lastly, the plastic hardware across the pack is Duraflex, which is a great and durable choice we’ve seen in a lot of other quality backpacks across the board. The first thing to note about the external components on this pack is that there are two ways to carry this duffle. You can carry it with the Velcro duffle handles or the messenger strap, which attaches to the bag by two D-rings. The duffle handle carry is a great way to carry your bag if it’s a bit lighter or if you’re only carrying it over short distances. One thing we really like about this carry method is that when you don’t want to use it, you can easily hide the handles via the Velcro pockets on each side of the bag. We love that Tortuga is thinking about this stuff and streamlining their bags so you don’t have a bunch of handles and straps just dangling around the exterior. The two D-rings are somewhat hidden by the Velcro straps, but once you find them you can attach an additional strap here and convert the pack into a messenger-style carry—either over your shoulder or cross-body depending on your preference. This messenger strap is pretty thick and has some nice padding, making it comfortable to carry even with higher weights. The strap attaches with Duraflex hardware and it’s highly adjustable as well. And just like the duffle handles, when not in use this strap can be easily stuffed into one of the Velcro-able pockets. 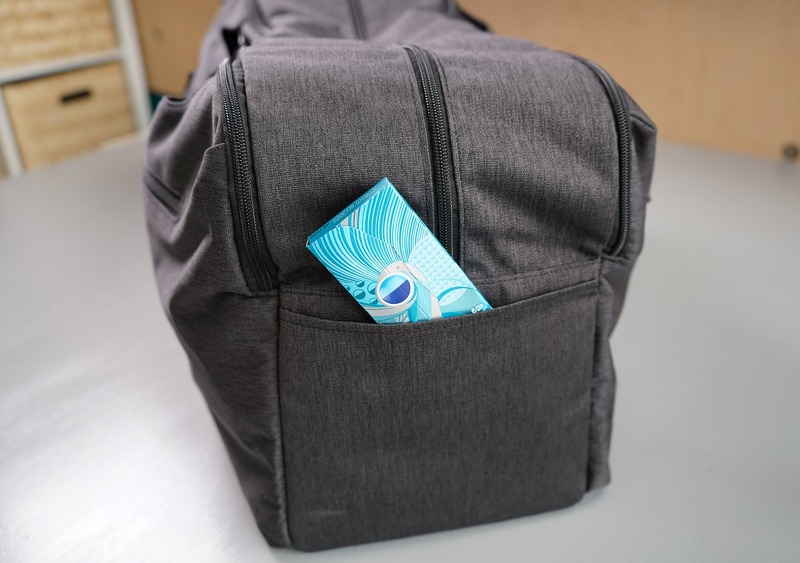 There is a small stash pocket on the front side of the duffle as well, which is good for storing any free-floating items that you want quick access to. That being said, we have noticed this pocket is really not suitable for a water bottle—there’s no stretchy mesh to hold larger items in place, nor is it grippy. So, this is mainly good for smaller items that don’t need to be zipped up or stowed away inside your bag. We think this is kind of a missed opportunity here, as a water bottle pocket would have been a welcome addition in our eyes. But, alas. 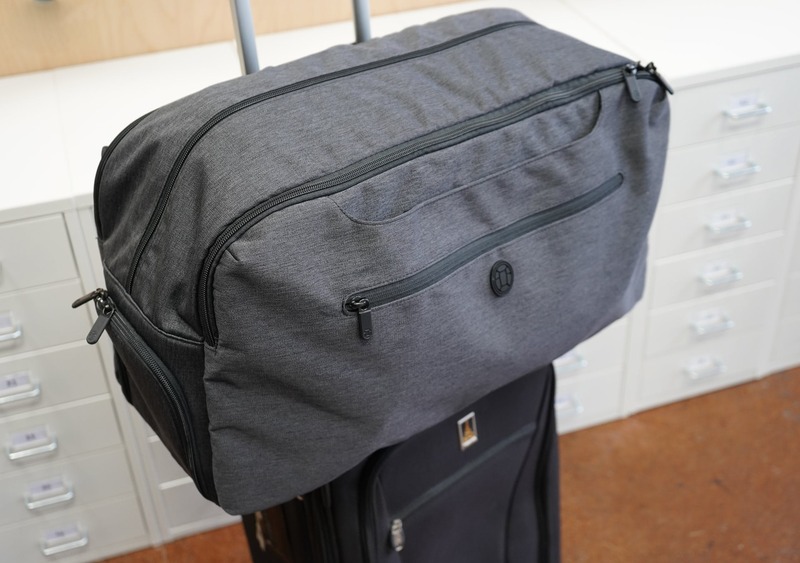 And rounding off the exterior components, there’s a luggage pass-through on this duffle. Normally, we’re not too interested in luggage pass-throughs, but in this case it makes a lot of sense. 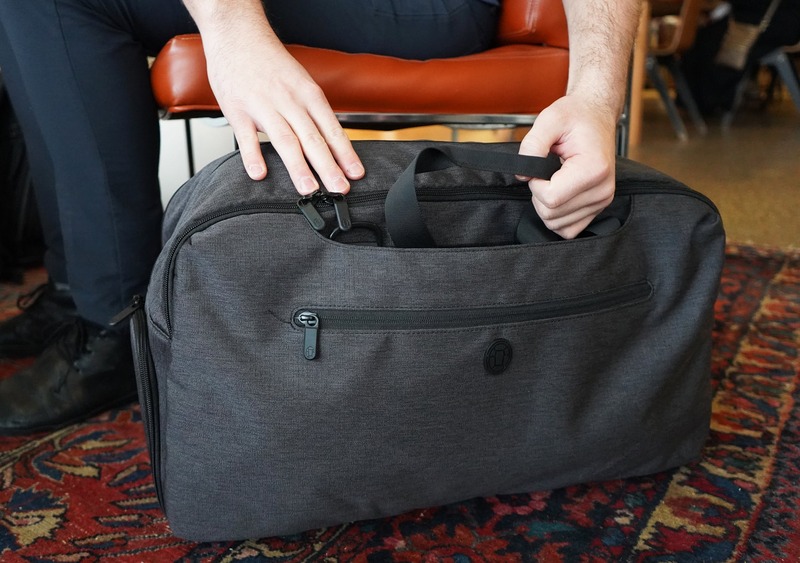 We think this bag could pair nicely with a carry-on roller bag, and you’ll love the added functionality of this pass-through if that’s your style. The pass-through itself is hidden by a small—and very cute, might we add—YKK zipper which opens things up and allows you to put a luggage handle through. We do have to say, however, that it’s a bit floppy and insecure. Plus, we’ve seen Tortuga do this a lot better on some of their other items within the Setout line…which has us wondering why it’s not the same on here. Kicking it off with the front “quick-grab” pocket, this thing has no organization but there’s plenty of space inside. It’s a perfect place to stuff a jacket or any larger items you need quick access to, although we do think it’s a bit large to be considered a true quick-grab pocket. 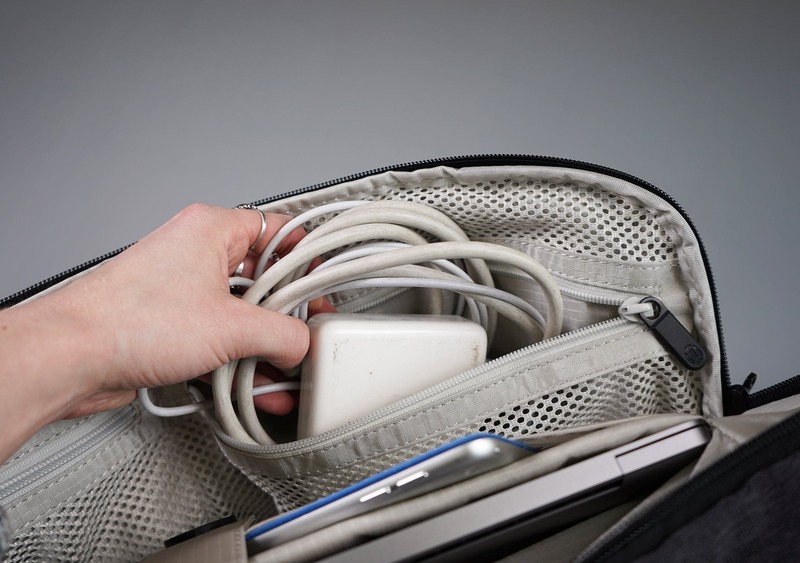 There is a smaller quick-grab pocket above that one, which is more of an actual quick-grab and good for storing a phone or other smaller items. 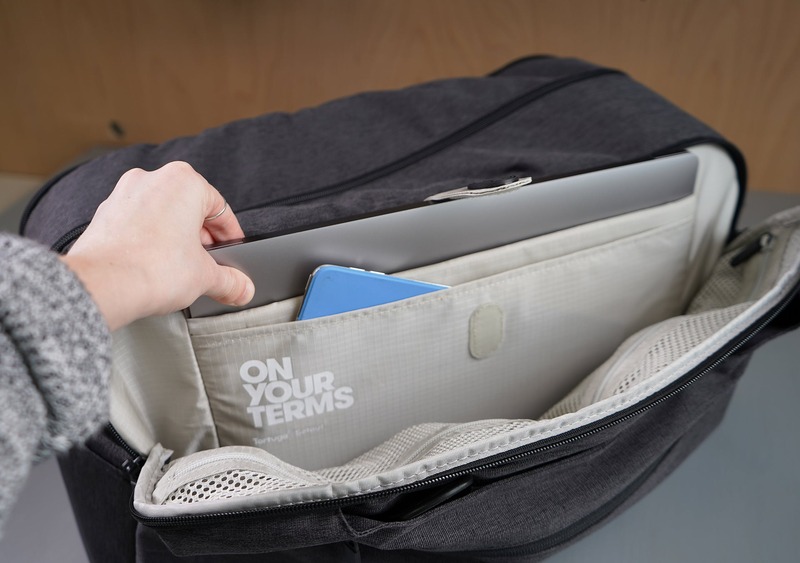 Directly behind that is a larger pocket that opens up with ample space, and it features a similar organizational system to what we’ve seen in other Setout products. 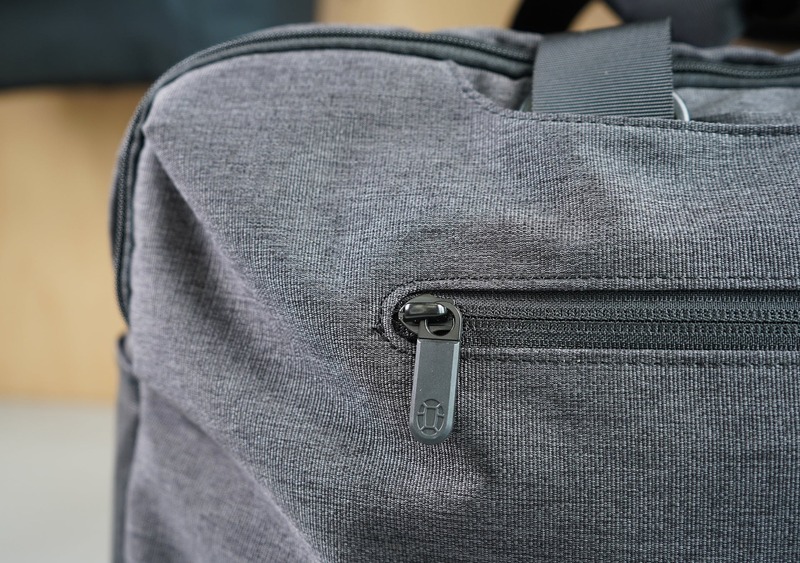 If you’ve been following our other Setout reviews, you’ll know that we had a bit of an issue with the organization panel in the Setout Laptop Backpack—mainly, that it was hard to access because the flap didn’t fold down all the way. Well, we’re happy to report that this organizational panel is easy to access and considerably more usable than the one on the Laptop Backpack. As far as the organization itself, there’s a stretchy black pocket at the bottom that’s good for a battery bank or small hard drive. Then, there are four credit card width pockets of varying heights stacked on top of one another, and one deep liner pocket next to three pen pockets. Above that, there is a larger partition for flatter items such as a small notebook with another zippered compartment on top of that. And finally, there’s a metal clip to attach something with a keychain. Opposite of the organizer side, there is another compartment that opens up with ample space for a laptop, tablet, and some other gear. There is a laptop sleeve which barely fits a 15-inch MacBook Pro and also has an additional sleeve on the outside for a tablet or E-reader. We’re curious as to why Tortuga didn’t include a larger laptop compartment, as it’s kind of a struggle to get a 15-inch laptop in there. Even just an extra inch of space would make a big difference here. 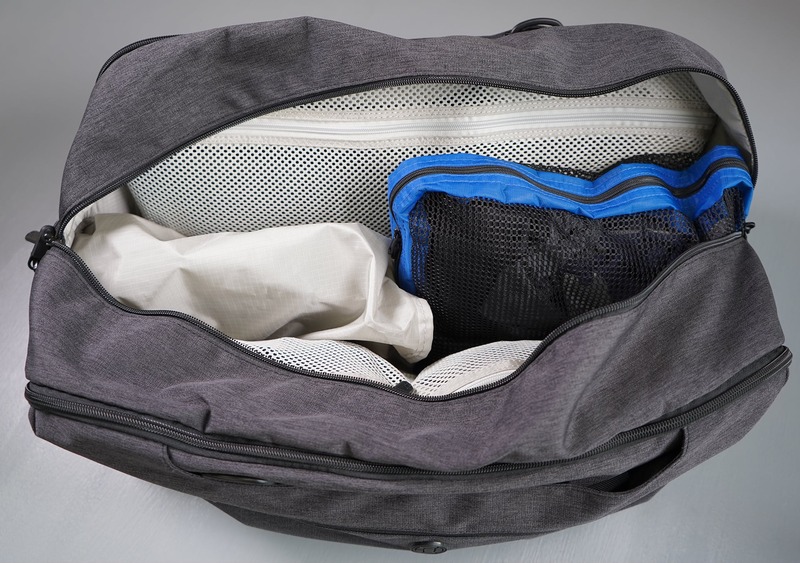 And rounding off this compartment, the flap side offers two zippered mesh pockets that are great for storing additional tech gear and cables that would otherwise just be floating around in your pack. Moving on to the main opening, the duffle opens up in a horseshoe fashion with a #8 YKK zipper. There is a generous main compartment area that’s great for packing cubes or individually rolling larger articles of clothing. Each side also contains mesh zippered pockets for additional organization. And finally, you’ll notice a big pile of polyester ripstop on the bottom on the bottom of this compartment. 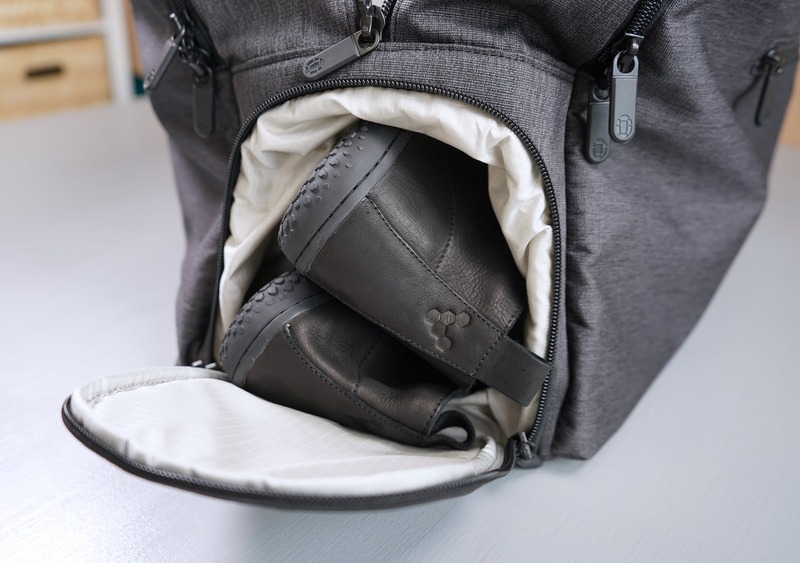 This is one of our favorite and most thoughtful features we’ve seen in this duffle—it’s a shoe compartment that allows you to store your dirty shoes inside your bag without muddying up the rest of your gear. We think there could potentially be some more weatherproofing in this compartment—if your shoes were sopping wet, you definitely might experience some leakage into the main compartment—but if you just wipe off your shoes, you’ll be good to go. At the time of this review, the Tortuga Setout Duffle Bag has seen two weeks of testing. As far as durability goes, we don’t have much to report besides some loose threads in a couple areas of the pack, which are pretty much a non-issue. 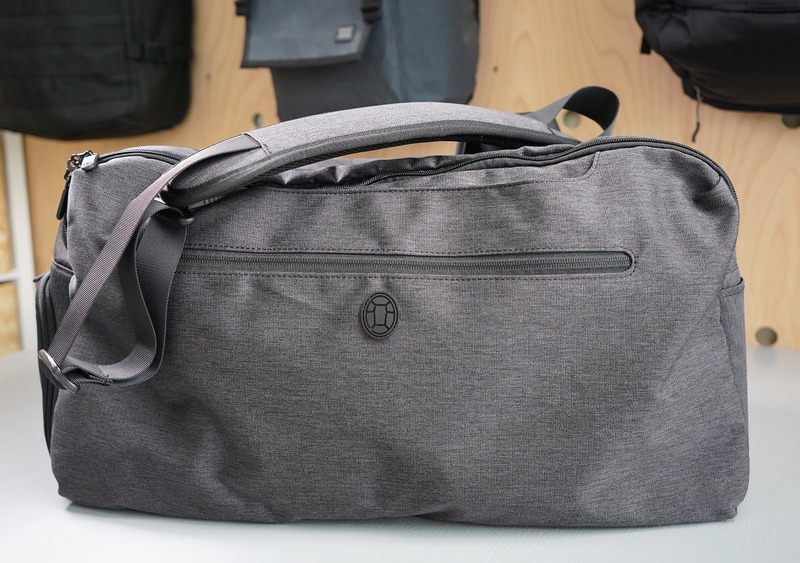 We imagine the 900D polyester on this duffle will hold up similarly to what we’ve seen with the Tortuga Setout, which we’ve tested for three months and only seen a couple small aesthetic blemishes. As for the experience of two bag travel, we like the concept. It’s nice to keep your clothing and other non-essentials in your duffle, leaving it at your Airbnb or hotel, and then keep your essential items in a smaller backpack that you can take out for the day. While the concept is there, we have to admit that we’re still getting used to this method in practice. Things can get a little tricky when you’ve got a fully laden duffle that you’re trying to cross over your fully laden backpack, so we’ve actually been making an effort to keep the duffle fairly lightweight in order to carry it by the duffle handles instead. This has worked well for us, although we still think you can easily carry this with the messenger strap—it just takes a bit of getting used to. The main roadblock we’ve encountered with this method is that the majority of airlines (in our experience) don’t allow you to take on such a large “personal item.” We’re not one for checking bags, so this two bag system isn’t exactly ideal for our travel style. But, to each their own. Either way, we’d recommend getting in touch with your airline before you head to the airport to see if this method will work for carry-on travel. Larger than we thought! 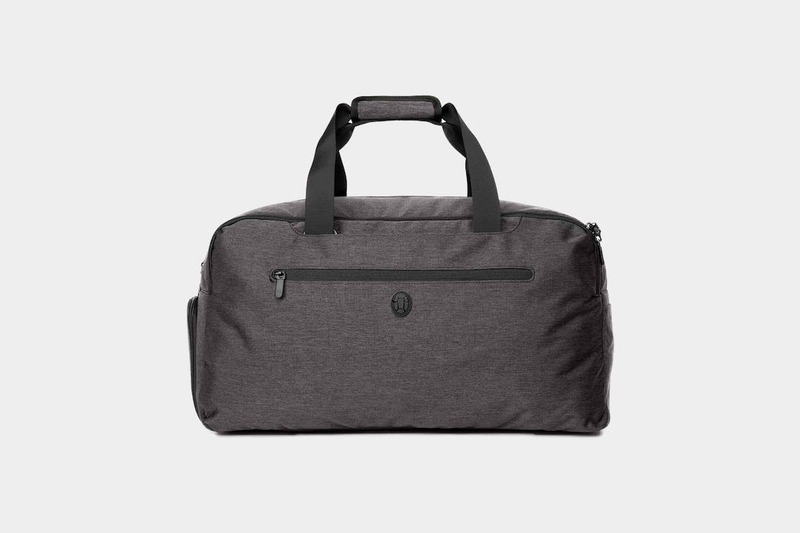 This duffle looks really nice, loving how easily you can access the organization panel. Not working super well on roller luggage and bulky to carry, but we’re appreciating the utilitarian aspects. The Tortuga Setout Duffle Bag is a great option for anyone wanting a large freeform duffle to carry around. It pairs well with the Tortuga Setout Laptop Bag, although carrying both of them together takes a bit of getting used to. 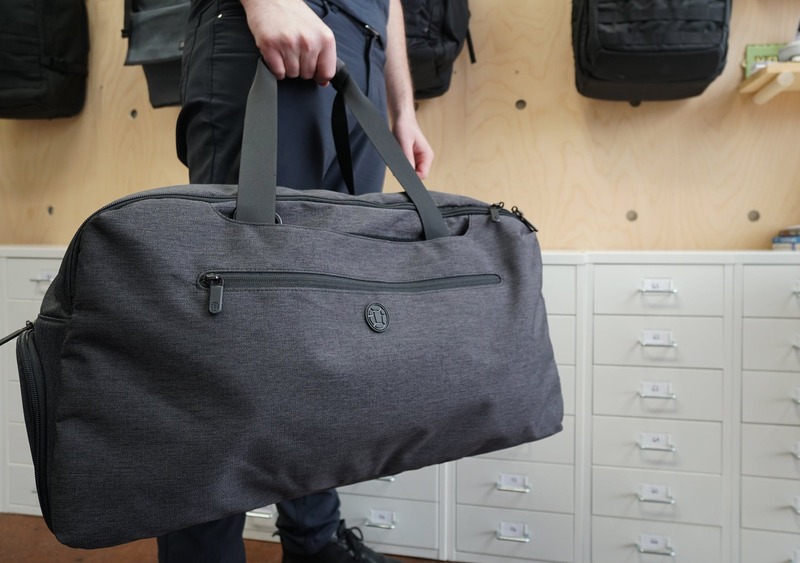 It’s a bit large and bulky, so if you are using the two bag method, we think it might work best if you don’t fill this bag entirely (to reduce weight) and carry it by the duffle handles instead of the messenger strap. Despite the couple of nitpicks we’ve pointed out, we think the organization and functionality of this bag is a great compliment to the greater Tortuga Setout line.